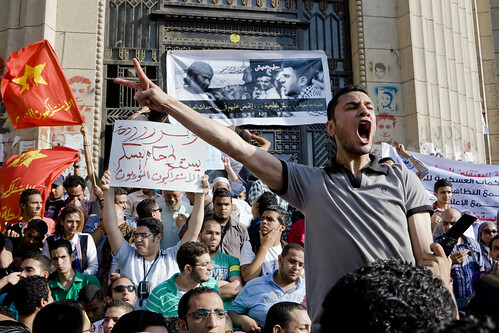 Thousands marched on May 6 on the parliament, denouncing the army’s crackdown on the Abbassiya protesters and calling for the release of the detainees. Hassam el-Hamalawy. Nearly three years after the fall of Mubarak, with the deep state and the military openly back in control, Egypt seems to have come full circle. How did that happen and what is the situation on the ground really like, as Egyptians go to the polls again to vote on a new proposed constitution? Vomena’s Khalil Bendib speaks with Egyptian activist, blogger and journalist, Hossam el-Hamalawy. Selma Debbagh wanted to explore the conflict in Palestine from a different angle: the struggle between the personal and the political. She wrote a contemporary novel about what it means for individuals to constantly weigh up the competing demands of the Palestinian cause and society, on the one hand, and their own individual wishes and desires on the other. “ I wanted to present a state of war, a state of being, a state of pressure, of siege.” Malihe Razazan speaks with Selam about her background shaped who she is today and how it has influenced her writing. Selam Dabbagh is the author of Out of It. The revolutionary spirit endures in Egypt as thousand of protesters stay camped out at Tahrir square for the second week in a row. In response to nationwide protests and the slow pace of reform Egypt’s Prime Minister, Essam Sharaf has fired several of his top ministers. We continue our conversation with leading Egyptian activist and journalist Hossam El Hamalawy about the prospects for the revolution to flourish and bring about real change. This week on Voices of the Middle East and North Africa, we speak with Egyptian journalist and activist Hossam el-Hamalawy about the recent labor movement in Egypt. Later we’ll talk about the Friday Night Palestinian Film Series in Berkeley. Finally we’ll here the music of Bay Area based music ensemble Aswet.